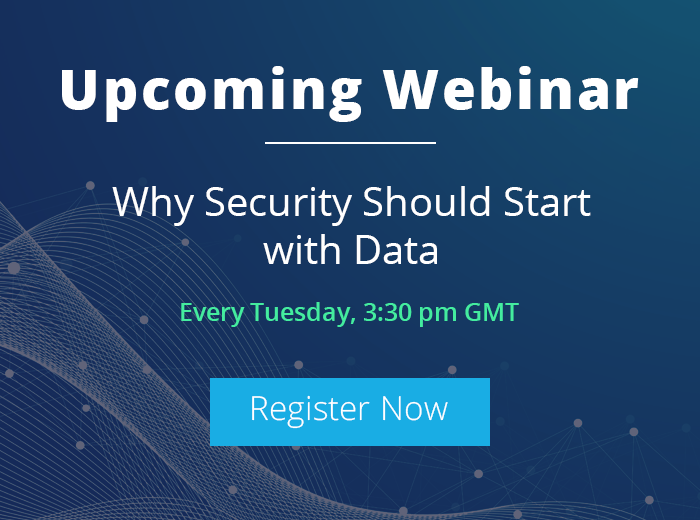 Despite the presence of sophisticated IT solutions, organizations often struggle to lay the foundation for a secure IT environment. Critical Servers, including File Server, Active Directory and Office 365, are a major target for attacks and data breaches in general. Regular auditing is therefore necessary to ensure the protection of critical business data, increase security and improve service availability with minimum downtime. To the relief of many IT administrators, Microsoft has incorporated some advanced auditing features into Active Directory, SQL Server, File Server, SharePoint Server, Exchange Server and more platforms. They come free with the product and help meet some of the basic auditing requirements for these platforms. 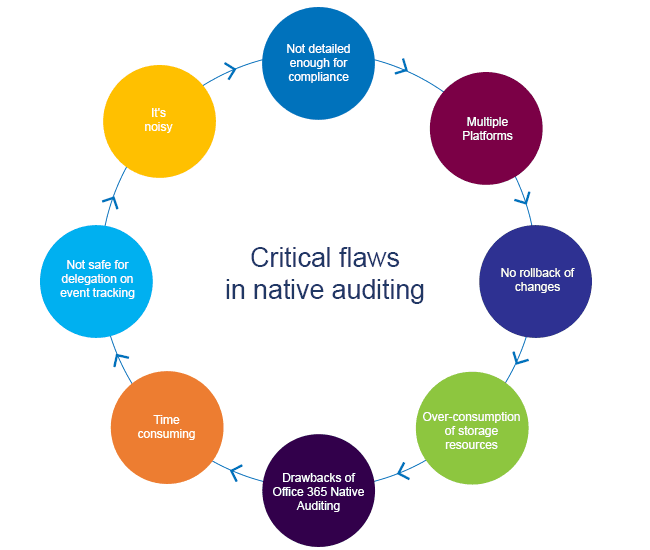 Native auditing can give you basic audit information on critical IT components, but to get to this information requires a disproportionate amount of time and manual effort, including sorting through a lot of noise to find the relevant event log file. In addition to this, native auditing suffers from some major drawbacks; such as duplicate logs, being reactive in nature, noise and more. You could probably get what you need from native auditing with time and patience, although this is often not something IT administrators have in abundance. Alternatively, there are some third-party solutions, such as LepideAuditor, that are easy to install and come with pre-packed reports. There are no pre-defined audit reports in native auditing. The only option you have is to create massive Windows PowerShell scripts or use existing templates (which can be unreliable). You also have to deal with multiple, complex scripts if you want to find out the health of SharePoint Server or File Server, for example. 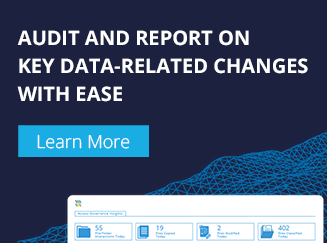 On the other hand, LepideAuditor records the details of every configuration change made to server components and produces more than 300 pre-defined audit reports. These reports can be shared with other users through email, or by saving on shared location at scheduled intervals. It provides more than 120 graph reports at Radar Tab and more than 30 reports on Health Monitoring Tab. If you need in-depth information on any of the components, you can subscribe to alerts to show the events in LiveFeed as it displays the changes in real-time. If you wish to see all configuration changes made across all server components, there is no single centralized platform available natively. LepideAuditor gives you a graphical dashboard which is a perfect place to summarize the changes taking place in server components at any time. By working on an easy-to-use, intuitive dashboard, you can find a list of all changes made to your environments; including who your most active admins are, modification trends, deletion trends and much more. Having these changes stored in one place gives instant visibility into unwanted or undesired change trends or anomalies. Native tools permit the restoration of deleted objects that have entered tombstone or logically deleted states, but it requires in-depth knowledge of PowerShell commands or the LDP.exe utility. Even if you have enabled Active Directory Recycle Bin, the process is not a simple one. LepideAuditor makes restoring deleted objects and restoring changes made to Active Directory Objects and Group Policy Objects easy. The rollback feature enables you to reverse changes to exactly as they were before – including group memberships, attributes, permissions and more. When using native auditing, Event Viewer will generate multiple events for a single action; resulting in an unimaginable number of logs. These event logs are memory-mapped files, so if you have configured the maximum size of logs to 2 GB, 8 GB of space will be permanently occupied by the Event Viewer in four different categories of Application (Security, Setup and System). The same is not true with LepideAuditor. It captures changes in real-time and displays them after processing. These logs are stored in a database at your SQL Server or SQL Server Express, and there is no limit the number of audit logs you can store. It also provides an inbuilt option to archive the audit database, to use a different database and to explore the logs from a previously used audit database. To audit Office 365 (SharePoint Online, Exchange Online, Azure AD and OneDrive for Business) natively, administrators must enable auditing using PowerShell. Native auditing lacks comprehensive predefined reports and thus makes it difficult to focus on a particular object or operation. On the other hand, LepideAuditor provides a dedicated set of over 100 predefined reports for Office 365 that can be generated in real-time to track permissions, the role of a user, mail type, groups, public folder, remote domain and offers unified messaging. You can apply advanced filtration on these reports, set real-time alerts with threshold limits, and share these reports with other users through email or by saving at shared location. Naturally, as an IT administrator, you want to know whether a group policy has been changed, a file has been copied to some other folder or some user has logged into a system. 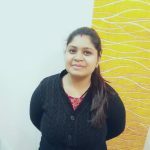 Obtaining details on these changes using native auditing consumes both time and effort. LepideAuditor shows you before and after values for every change to improve the level of detail in every report instantly. This feature enables IT administrators to make quicker decisions and resolve IT issues faster through improved system management. The solution highlights different types of changes in various color with old and new values. Native auditing does support the delegation of event tracking or reporting to ordinary users using permissions on different server components. But the process is noisy, time consuming and complex. A user with delegated rights can misuse their privileges and easily become an insider threat. LepideAuditor lets you delegate selected reports to selected users that through a secured and password-protected URL, which can also be configured to run on HTTPS. During this process, no privileges will be delegated to the selected users in Active Directory. It is easy and safe. The selected users can view assigned reports, track events , customize the reports and download them to their computers. Event Viewer, and other native auditing tools, do help you meet compliance requirements, but numerous drawbacks in functionality mean that IT teams cannot rely on them. LepideAuditor overcomes these drawbacks and provides you with predefined reports to help meet the IT related requirements of PCI, HIPAA, GLBA, FISMA, SOX, GDPR and more.